Huichol Hiphop legend RedCloud comes at us with his new album release just in time for summer - "1491 Nation Presents: MC RedCloud". 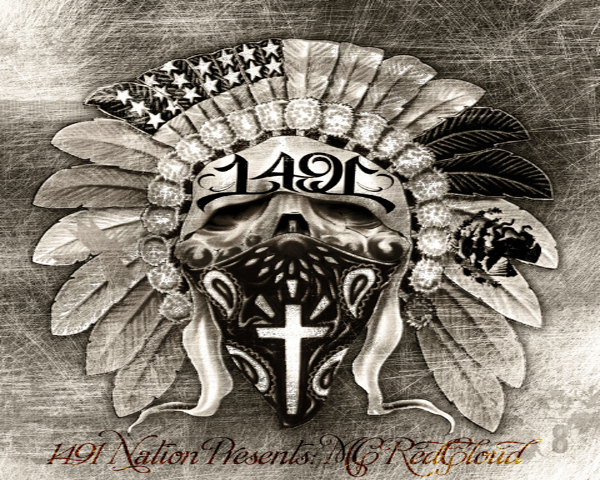 MC RedCloud and the 1491 Nation bring a great release for the summer including 18 tracks, some funny skits, bangin' beats and Redcloud's usual deadly rap flow. Best of all, this release is FREE for download, but we recommend you purchase the entire CD - you name the price! - and support the MC Redcloud and 1491 Nation movement. A legend in the game in his own right, RedCloud has been representing Indigenous Hip-hop for the last decade out of Hawthorne, California. His freestyle skills carry with it a reputation of high-energy, mind-boggling skill and style that has rocked crowds all over Turtle Island. It's one thing to freestyle in front of people and be OK at it...but to dominate with crowd suggestions and rhythmic flow and style is what separates RedCloud from the rest. Now he lays a beating to your speakers with this new summer release fully laced with real Hip-hop style and sounds. A mix-tape style album, he uses some amazing sounds and rap styles we haven't heard since the golden-era of the early to mid-nineties but updated to a new bump of west coast rap grooves and RedCloud's unmistakable flow and voice. It's amazing to hear one of our own bring an amazing level of rap skill and musical talent into the Hip-hop game. This album definitely raises the bar and benchmark to another level. This release is sure to get some plays in your ride, BBQs, 49ers and wherever else you have a great sound system. To listen to, download and purchase the new MC RedCloud album go to mcredcloud.bandcamp.com.